Every Lancashire County Council school with a parking restriction like this will be visited by an enforcement officer at least once in the current academic year. All Lancashire County Council schools can expect to be visited by parking wardens in the current academic year, as part of a crackdown on parents and guardians who stop on zigzag lines outside school gates. The plan was revealed at a meeting where councillors were also told which parking perils could – and could not – be tackled be the authority’s attendants. Peter Bell, the Highways Regulation Enforcement Manager at Lancashire County Council, says traffic wardens will always try to move motorists on before issuing a ticket. But Peter Bell, the county’s Highway Regulation Enforcement Manager, said his priority was “keeping the roads clear”, not issuing tickets. The authority is responsible for on-street parking enforcement in all areas except Blackpool and Blackburn with Darwen. Here is what councillors were told about Lancashire’s perennial parking problems. The county’s schools were asked whether they would like wardens to visit to prevent parking on zigzag lines outside their gates – but fewer than a third said they would. Those schools were targeted between January and July this year, when 76 tickets were issued. Now, the council has taken the matter into its own hands and plans to visit all schools with parking restrictions in the next twelve months. But it is not necessarily proving a popular policy. In the first two weeks of the new scheme, 26 vehicles have been moved on. And Mr. Bell appealed for feedback from schools, so that those with the biggest problem could get repeat visits later in the year. Peter Bell admitted the council had “got in a rut” by patrolling the same areas day in, day out. That had allowed hotspots to develop elsewhere, which were attracting complaints from residents. Now, attendants are more responsive – “almost like a flying squad”, according to Peter Bell. And that means you never know when a warden might wander by. There is no national policy on pavement parking, although it is now prohibited in some areas of London. A government consultation is currently asking councils whether a similar scheme should be rolled out across the country. If pavement parking causes an obstruction, however, that is an offence which can be enforced by the police – but only if they see someone being obstructed at the time. “If a car is parked on the pavement and a police officer sees it, nine times out of ten they won’t take any action – they have to witness the obstruction,” Peter Bell explained. And he warned that pavement parking in Lancashire might be “a necessary evil”. “There are lots of terrace streets [in the county] – if there was a pavement parking ban, you would halve the capacity of every street,” Mr. Bell said. But St Annes South county councillor Edward Nash said the practice was causing serious problems for older and disabled residents in his area – especially when drop kerbs were blocked. He was told that the council can – and does – enforce obstruction of these kerbs – with the exception, in most cases, of those in front of private driveways. 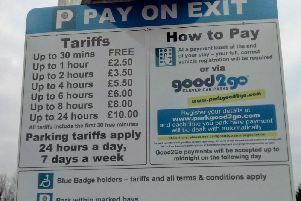 ***There are two levels of parking fine issued by Lancashire County Council. According to parking boss, Peter Bell, “as a general rule” if you can park on a round-the-clock restriction, you will be fined the higher rate of £70. But if you stop somewhere parking is permitted – but overstay your entitlement – you will be fined the lower rate of £50. ***Most of Lancashire’s parking restrictions (20 percent) are in Preston. Ribble Valley has the fewest, with under 5 percent. ***The link between signs and yellow lines has been removed – councils can choose one or the other if it is “reasonable” to do so, Peter Bell said. ***It is no longer a legal requirement for yellow lines to have a T-bar ‘transverse’ mark at the point which they stop, after parking fines were successfully challenged because of a regulation which required it. The practice remains “advisable”, Peter Bell said. ***On-street parking bays can be any colour a council chooses to paint them - but if they are marked out by a dashed line, the line itself must be white.